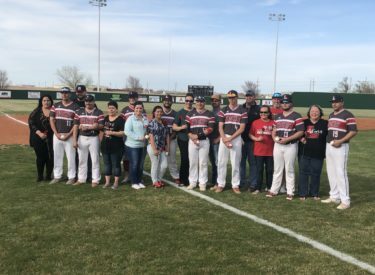 The Liberal baseball team finished their home season with a 11-1 win over the Dodge City Red Demons Tuesday night. The game was a five inning run rule on a night with temperatures unseasonably warm in the 80’s at the National Beef Family Sports Complex. Dodge City scored a run in the second to take the lead. The Redskins responded with an eight run second inning. Javier Bojorquez singled and Braxton Hyde walked. Dylan Thompson singled home a run to tie the game. Ethan Green laid down a sac bunt. Brodie Warren walked. Rodney Pando singled home a run on a pop up to second which was lost in the wind. Elijah McCarter reached on an error scoring two runs. Syris Dunlap ripped an RBI double making it 5-1. Pancho Terrazas followed that up with another RBI double to make it 6-1. Liberal scored another run on a wild pitch. Thompson added his second RBI single of the inning to make it 8-1. Dunlap singled home two in the third. Terrazas singled home another run. Dunlap finished 3-3 at the plate with three RBI’s. Thompson and Terrazas added two hits a piece. Braxton Hyde pitched all five innings improving to 4-0. The Redskins have won seven of the last eight against Dodge City. The Skins are 6-2 and 2-1 in the WAC while Dodge City is 6-2 and 0-2 in the WAC. Liberal plays at Garden City Tuesday on 1270 and kscbnews.net. The Redskins finish 5-1 at home.